How are our zero waste family doing? You might remember we started working with Sian and her family to help them reduce their waste. Six of them were producing one wheelie bin of landfill waste per fortnight and Sian wanted to reduce this as much as she could. Just to recap, Sian and her husband are on a limited income, still have one child in nappies and Sian has health issues which means using washable nappies is not an option. They also live in a small house with little storage space and need to use a fair amount of supermarket pre packaged food to stretch their budget. 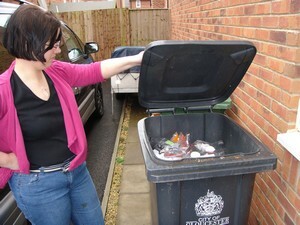 After having a good old rummage through her rubbish we suggested that Sian started separating her waste. We agreed she would keep the nappies separately and start washing all her plastic waste so that she could really see what was going into the bin each week. In addition we asked the family to be more aware of what they were throwing away because when we emptied out her wheelie bin we spotted a few things that could have been recycled or composted. We showed Sian how to test for polythene and recommended she started recycling it and asked her to consider setting up a compost heap. Finally we asked her to keep a food diary so we could identify exactly what she was buying – with this information we could make further recommendations for how to shop zero waste style. Two weeks after we set these challenges we visited Sian again to see how she was getting on. We’d done a little homework for her in between visits and realised that not all supermarket pre packed fruit and vegetables were cheaper than lose. In a random check around Sainsburys we found carrots, broccoli and apples were cheaper to buy lose, whereas onions and baking potatoes were more expensive lose than prepacked! We suggested that Sian checked online before shopping to find the best deals. Since we last saw her, Sian had indeed separated her nappies and set up a recycling area for polythene. Everything that went into the wheelie bin had to be checked by her first, so that all recyclable and compostable items could be diverted from landfill. She had ordered a compost bin from the council. What we loved about Sian’s new lifestyle was she was finding it easy to maintain. She said “this new regime adds no stress to my daily routine; all it takes is a little more thought. Instead of automatically picking something up and putting it into the bin, I simply put it into different bins”. Throughout our discussions, Sian kept reiterating how easy this was for her and stressed that it was simply a change of thought and an extra five minutes when washing up that made it all happen. Landfill waste for a fortnight after the challenge! We couldn’t wait to get that bin on the scales. We decided from now on to keep the nappies out of the weigh in and just weigh off everything else. The nappies will be in place for another year or so and there is little that can be done about them. But Sian and her family had an astonishing 800gms of waste for the fortnight. Isn’t that amazing? We estimated she would be able to go a good three to six months without having the bin emptied at that rate! Nappies will be put out once a fortnight for hygiene reasons, but Sian is going to keep hold of the rest of her landfill waste to see just how long she can go! We don’t need to see her for another month in which time she will have set up her compost bin, be compacting her landfill waste, be checking online before shopping to stretch her budget and keeping a food diary so we can look at other ways to reduce packaging. But you know what? Since then Sian has IMd me to say she’d found some washable nappies in the loft, so who knows what surprises she’ll have in store when we next visit! Sian's landfill waste for a fortnight now fits into a small box! Well done Sian. That is amazing! And in such a short time. I’ve never thought of weighing my waste.Might give it a go next week. Congratulations Sian. I think it’s important to accept that there are very few people who are able, or willing, to achieve zero waste on a permanent basis. I am full of admiration for the Greens and others who do, but it’s important to recognise that every gram knocked off our landfill waste is a result. The first step is the most important and Sian’s off to a good start. Keep up the good work. There’s so little in that bin!! And fingers crossed for washable nappies! Has Sian also managed to read about diaperless babies (EC)? @Alyson: Oh yes, have a go and we’ll do some distance ‘green audits’ with you – it would be fun! @Layla: Sian has 3 other children, so I don’t think EC would be workable for them, but I met her today and had a tour of the washables; she’s doing so well! Well done. I am trying to give it a go to get my bin like that, we shall see. Sian, and family, have started well in their Zero Waste effort, bringing back memories of other enthusiast’s starting points. The beauty of the trend is the continuing and improving performance such that bin days become less frequent, 1 for the Green family’s first full year. My own individual 5 year attempt is still on track and there are many improvements ahead. Contacting manufacturers is yet another addition which should have a positive outcome. The waste audit is very important. Without stopping and looking at what is going into your bin you just don’t realise what you are throwing out and so can’t find alternative and/or better solutions. Congratulations and remember it isn’t really all or nothing. You have to try and build on your successes but packaging, products and circumstances change and you will have change what you do again. Well Done! It is just mind boggling to think what could be acheived f every family took this approach – must get back on the promoting band wagon here! Mrs Green, what exactly is the test for the polythene? I think there is quite a lot of plastic that we throw to landfill tht could possibly be recycled, I would be extremely grateful for your advice! @Julie Day: Great news – good luck with that Julie and let us know if we can be of help! @John Costigane: Good to hear you are still on track with your personal target, John – what a brilliant achievement! @Jane: a waste audit is absolutely the first step, Jane – otherwise, as you say, you have no information to work with. I remember doing one and being very enlightened when I saw for real what was going into the bin. @H0gg!t: You’re right, H0gg!t; just imagine what the UK would look like if we all followed Sian’s example. Regarding polythene you can do the stretch test. If it stretches without breaking, it is most likely polythene. It’s quite simple – do it with something you know to be polythene such as magazine wrapping or toilet roll outers to get the feel for it. Thanks for the comment, Mrs Green, However your effort, which would be, by comparison, 2 years for the 3 family members at most, is easily within reach judging by your recent improvements. A 5 year target must be a possibility for you which would make the effort 3 times better than my attempt. The family of six equivalent, for Sian, might be 1 year though this will take time to setup from this year’s starting point. With family member(s) moving in here soon there will be some adjustment required and some patience on my part necessary. My straightforward Zero Waste effort will be shattered, but you, and others, might say – Welcome to the club! I visited Dobbie’s garden centre for Organic Rooting Powder for propagation and unpackaged compost for pots. There were slight negatives on both counts. Organic equates to poor packaging, as always, though the pot should last a while. Compost was plastic bagged only but still worth finding locally for a Zero Waste Alternative. There were plenty of various-sized propagators on sale anticipating a bigger take-up by Grow Your Own enthusiasts. Quick-growing Rocket, and Leek, seed packs were also added to my hoard. @John Costigane: 😀 ah, I’d missed you had family members moving in – is this a full time arrangement or temporary? I know what you mean about sacrificing packaging for a better product; we find that with some foods we need to by LMG. I’ve never seen compost in anything other than those thick plastic bags, but they are great for reuse around the garden or have even been offered on Freecycle with success. Let us know how you get on with rocket and leeks! @Mrs Green: The home is ideal for family members working away from home and in my locale. Frequent regular visits rather than full-time is the likely outcome which is obviously less demanding than the usual full-time family situation. Reuse as grow bags might be the best option for used compost bags which would require more care in emptying than my normal destructive approach. They could also be used as covers for overnight rhubarb growth, or pots, with firm grounding essential. @Mrs Green: 562g. Thought it would weigh more considering the amount of chocolate bars my daughter ate and my husband tidying up the garden. @John Costigane: Good to hear, John – you’ll enjoy the company more on a part time basis, perhaps! @Alyson: Wowee – that’s fantastic – well done you! Even with the garden tidying too. Are you going to continue to keep a record of your waste? After a week’s seed potting in the propagator, and a more recent dash for the usual pots when progress seemed slow there, there has been decent growth including 2 tomato plants in the ‘indoor greenhouse’. Of course, it could simply be the good weather! What can be said is that the propagator is faster even though I am still in the learning phase of its use. One aspect of note is the condensation on the inner side of the clear lid resulting from a temperature difference outside the unit. The recent warm spell has seen this reduce and the 2 sliding vents may prove adequate for summer conditions. When all else fails, it is easy enough to wipe dry. With the welcome new growth, I decided to compost the last over-winter basil plant which failed to benefit from the improved conditions. Winter plants will be the choice in future years with seed collection from the best plants a preferred route. Constant moisture in the propagator suited tomato, kale and rocket with all 3 producing good growth and stems just developing beyond the germination stage. Sweet Basil has proved slower due to its preference for dry soil not catered for by the unit. It was good to see the familiar leaf pattern for last year’s main focus but numbers will be less this year with the more challenging tomato plants needing much more attention. Recent colder weather has delayed germination in both propagator and normal pot which suggests effort should be maximised in the best temperatures. All 4 seed types have developed inside the unit but tomato alone has not developed outside it which indicates that propagation might suits it more than the other plants. The late emergence of greenery from 2 set aside pots means that tomato plants have formed outside the propagator as well giving four sets for comparison as growth develops ie kale, rocket, sweet basil and tomato. So far, the first pair of tomato plants have overnighted in the damper, warmer, enclosed environment of the unit with no ill-effect. I apologise for hogging the comments here but setting up is the biggest part and regular reports will follow. After 4-5 weeks the latest info will added. Your card inner holders should fit in well since easily 20+ can be contained replacing the 6 maximum pots, or tray. The only issue might be the effect of moisture and this can checked out. Also you mentioned creating a lawn and it will be worth trying turf formation especially with my moss-thinned square lawns back and front. The north facing front has little sunlight so is vastly more affected then the suntrap backdoor. @John Costigane: Hi John, good to hear about your progress and experiments in gardening; it’s useful for all to read 🙂 You’re right about the cardboard tubes; you can fit many more in than the plastic pots, but you do need to watch watering. I never had any problems as long as I kept an eye on things on very sunny days. Thanks for that. Hopefully others will try the same and bring their own perspective. A neighbour bought 6 various tomato plants in their first pots recently with all requiring repotting due to full rooting, and damaged leaves or slightly-wilted trusses. She generously offered 2 for my own growing efforts which will be repotted asap. In return, I will offer to repot the remaining 4 for her own family household. Joint efforts can be useful and this should also help with my own new plants though they are around 8 weeks behind. The first plants leaves beyond germination have grown to an optimistic 1cm in the 2 propagated while the 2 potted-normally are chasing hard. Current numbers of tomato plants include 4 Moneymaker (ASDA) plants from seeds, 5 leggy sets of Cherry tomatoes, too long in a glass of water, and 2 second pots of Cherry tomatoes ready for uptake by my brother. I returned to my neighbour 3 Cherry type looking fine in their second pots and weeks ahead of my 2 inch plants. These latter have enjoyed the double bonus of hot sunny days outdoors and warm nights, for cold propagation. After a good run of heated propagation there was a damp ending which gave weak tomato and basil plants from seed. The tomato plants fried in the sunshine and basil plants were minute but still viable. I therefore dried the insides of the unit, after switching off. Following the recent sunny days 4 tomato plants, and 1 sweet basil, were placed directly into the propagator and left overnight. In comparing the basil in and outside the unit there was definite increased growth in the single plant with the 3 outside unchanged. This morning, a muggy dull day, these 3 were also placed inside and have shown a similar increase within a couple of hours. The only limit is the 4 inches of clear space for plant growth which is fine for now but there is value in a higher-roofed version to maximise the effect. @John Costigane: Hi John, It’s great to share resources with friends and neighbours. My tomatoes went yellow because I took too long before repotting them, but they have recovered well after some TLC and larger space to grow and thrive. I’m growing money maker for the first time this year, along with the usual cherry tomatoes that Mr G favours. Great to see you have both types of tomato growing at home. My limited-space approach means that only 2-3 plants are practical here and the plan is to grow only Moneymaker completely, to avoid cross-pollination. Of course, in your big garden that is not such an issue. Cherry tomato plants will hopefully go to others, 2 so far, with 2-3 plants per person. Any spare could be kept separate and mainly indoors. I also plan to give away some Moneymakers to those who prefer them. 7 more sets of seeds are in the heated propagator, 3 basil and 4 Moneymaker, which means cold propagation has ceased meantime. The idea for next year will be to germinate seeds in the 8 watt unit and cold propagate mainly in a larger roofed version for maximum plant height. I used a card inner, for one of the basil seed sets which became damp darkened within a few hours, showing the actuality of propagator function. I have yet to assess the best amount of water to use for soaking which can be affected also by ambient temperature and humidity. The card inner can be used to help this with time to full dampening measured and seed germination time also. This shows the value of card as the other way to assess wetting is to lift the lid and test the pot compost. Repotting has been seen to work which makes me think that the current 3-potting setup could be increased to 4 or 5. The growing plants, from seed, will be repotted at about 4 inch height which is half the height of the recent over-rooted Cherry tomatoes, A comparison will be worth making between them. Planting out is a necessity for kale and rocket to clear some space indoors and empty some pots for reuse. This will require slug measures, including eggshell pieces, coffee grounds and plastic/metal jagged stem guards. Sweet Basil will also be planted out much later to provide seeds for next year with the 2 best pot-growing selected. These will be given maximum protection. Alcohol baths will be used to reduce slug numbers. Reuse for the leftovers will be considered with composting most likely. After 3 weeks, tomato plants have reached short of 4 inches for 2, in larger pots, and 3 inches for the sole remaining propagator sourced one. The missing 4th came a cropper in a finger soil test which had been a success in all other pots. The biggest change is that the taller plants have leaves which look like the more mature cherry ones. The smallest pots may not be suitable for tomato seeds since moisture control is more difficult. I checked the root development of the lost plant. This had 1 inch of increased depth but not lateral spread. This works fine since the moisture can be assessed to a good depth and the air introduced may also help root spread. Watering also gets a mention there, being a critical component. A weekly soak followed by feed is the best. In the sun, especially with regard to a suntrap here, Mulch can slow surface drying. I have used coffee grounds. The King of Herbs, in a far drier compost, loves the sun and 3 plants lead the charge with1/2 inch leaves. I enjoyed Karen’s (Almost Mrs Average) “slug hotel” comment last year but I can confirm that all roads (slug trails) lead to the alcohol. There have only been a few so far but the outcome is certain as they have a taste for the booze. so far the results aren’t taking me by storm. One tiny plant is poking it’s head about 2 inches out of the bottom of the planter. I hope it eventually looks like the one in the picture, but I’m not so sure it will! @Poppy: Thanks for that, Poppy. Hanging basket types and even upside-down tomato plants, which are huge, are worth trying. I have found repotting with watering, then feeding next day gives plants a boost. Best of luck with your attempt! This year may, or may not, be successful here. The point is to do the max and learn from the experience for future years. When others add their own experiences it just makes the whole process clearer for all. I recently added a necessary, larger propagator, using birthday money, which has about 11 inches clearance. Hot, humid evenings should be a blast since this seems to give the best conditions for extra growth, judging by a suitable evening last month. The 4th week had seen the best weather so far this year and ideal for ‘growing your own’. The maximum hours of daylight have seen pots in direct sunlight for up to 12 hours. Plants have benefited, though kale does not last the whole day but revives in shade. The tomato plants reached over 6 inches, also showing a 1/4 inch base stem thickness and an emerging branch holding the future adult plant in miniature. I have a small full-grown plant, bought along with the large propagator as a guide. A third homegrown smaller plant has been repotted deep to encourage extra lateral roots but may not grow further. Other seeds are emerging now which will all be used. Sweet Basil is doing well and so early compared to last year while rocket also thrives in the hot sun. Cold propagation is the standard now with plenty of space for all but tomatoes, whose large plant size is apparent even now. Seeds have emerged in the card pots except for tomato type but other cards may improve on that soon. @Mrs Green: Great to see your success with a pot bound plant. The plant from Dobbies has grown to 16 inches tall far surpassing the earlier pot bound trio for my neighbour. This indicates that having a few roots visible, rather than the 20+ for each the earlier three, is a better prospect. There are also plenty of new flowers appearing on this plant too which is sooner than I expected. What is the timescale from flowers to fruit? The 2 remaining quick growers have reached 7.5 inches but the biggest change is the upward thickening of stalks which are now half the breadth of the older plant. Seed germination has completed for now with 9 Sweet Basil and 8 tomato plants all in good shape. I was saved by 3 double germinations for the latter, 10 day minimum standard. Bigger pots each with several groups of tomato seeds might be better than many small pots, which tend to have moisture build-ups. @Mrs Green: Thanks for that, Mrs Green. My neighbour has some minute cherry tomatoes from 1 of the trio returned to her but I shall desist from comment on the other 2 save saying over-watering occurred (more about that issue on Sunday coming). Today, all 3 plants have been repotted with the Dobbies (pronounced doe-bees) plant now in the biggest pot 9 x 9 inches. Its previous 7″ pot was filled with the root ball within 2 weeks which shows the growth rate. This plant seemed ordinary when purchased but looks can deceive. The other 2 grown from seed have paused growth though the root balls are a lot smaller than I expected. This is only their first repotting, to an 8″ pot in this case. They are probably a month behind the other one but will hopefully be just as good. Week 6 has seen the welcome return of rain in quantities. The dry conditions kept back planting-out of rocket and kale, emptying of the compost bin (4 months late so far) halted rhubarb growth and even delayed the flowering of bushes. The last problem is resolved and bumble bees are at last active here. I counted 8 yesterday on the ‘tree’ bush and will check if their number has fallen from last year. These 8 are much smaller than usual due to the long winter. The hypericum bush has shown 1/3 less growth for the same reason but should flower as normal with the flowers already showing their tell-tale yellowing. Growth in comparison for the potted plants will tend to suffer though there has been good progress up to now. Sweet Basil, rocket and kale have reached a maximum of 3 inches thanks in part, or in total, to the large propagator. Tomato plants, after repotting, have reached 19″,9″ and 8″. The largest has 24 flowers and tiny buds. This new factor has given the extra inches growth from last week. On the subject of over-watering, seeds, buried and germinating, plants,of differing heights, and root formation have all suffered for me and my neighbour. The exception to this has been the 7″ pot-sized root-ball from the biggest plant which absorbed 3 pints of liquid in the weekly soak and remained dry. The target now is to create further such situations as far as is practicable for the home enthusiast. The now 11 emerging plants will be the focus for this. Factors which might be worth testing are top/base watering, water temperature and water volume. The backdoor, south-facing suntrap makes the plant growth a success. The main drawback is the wind flow from nearby less-hot areas which happens occasionally. Big plants, like the tomato plant, need protection so planting out will be delayed as long as possible. This issue has arisen more quickly than anticipated from the Dobbies plant size. My preference is for a large container with a removable covering. @John Costigane: Hello John, well we had threatened rain but it didn’t amount to much. The sparrows have killed off all my kale by taking dust baths in the pots 😀 And I’m pleased to say bees are very much on the increase here at Zero Waste Towers; which is a most welcome sight. I met a man from Israel last weekend and he told me about the drip systems of irrigation they used over there with great success. Water shortages is one of their biggest problems, so they are continually looking for ways to maximise this precious resource. The shifted Jetstream, possibly a cyclical event, has changed the weather with a dry June (and Wimbledon) noteworthy events. Of course, the severe winter was another example. I too had the smaller birds dust bathing which may indicate a lack of lying water for them. Your kale loss is another casualty of the recent spell which forced changes in my own small-scale effort. Has your large garden space been affected in other ways? Good to hear from one of the many hotter countries about water use. ‘Grow your own’ is a UK-based trend which fits in with Zero Waste when all stages of the cycle are done at home – seed to plant to seed. There are other ways to grow tomatoes but complexity will not suit everyone. Pots are ideal for keeping plants in full sun all day, making mobility key. Week 7 has seen 2 significant changes. Firstly, the now 23″ high plant has 7 green tomatoes from the minute to the size of a gooseberry. Secondly, the larger of 2 home grown plants has roots at the base of its 8″ pot. indicating proper root ball formation while the other plant is yet to develop it fully. Both plants have 8 branches which form the base of the overall moneymaker type plants. In the centre, they have a sizeable inverted cone which will form the v-shaped stem arrangement, as seen in the Dobbies plant. This ‘green cone’ will provide the height of the overall plant when clear of the branches but sits 7″ high at present. The rain deficit has been restored allowing full flowering of the first bush. Bumble bee numbers have increased to 15+ in between the downpours. Hopefully the forecast rain has reached your area as well. After a flaming June, July has been worse than normal here. @John Costigane: Morning John; I hope the sun is shining for you this morning 🙂 We’ve had our good share of rain for which I am thankful. Hopefully you’ll have some more tomatoes by now. I’m amazed mine are still green, they seem to be taking forever to ripen, despite warm temperatures. At this rate I’ll be making green tomato chutney! @Mrs Green: Hi again. Glad to see you had some rain eventually but the rain has continued here for 2 weeks with the occasional sunny spell. My tomatoes, now 9 in number (and bigger than last week) with 5 further flowers pollinated, 1 unpollinated still and 3 buds, are all firm and green as well. The neighbour’s cherry tomatoes have reddened which is hopefully a good sign since I had repotted them. Ripening is obviously another aspect of growth which may require patience and is yet another thing to learn from the experience of tomato growing. The 3 moneymaker plants have been repotted with the biggest now in a 15″ metal pot. This is its final location unless I decide to plant out. I keep this indoors like the rest unless its sunny outside. The other homegrown ones both have their first flower which means passing on to my brother and my neighbour will be soon after this 8th week. This is a good way for the 2 contacts to start their own moneymakers and in similar fashion to the one I bought from Dobbies, though the plants are completely different in form. In future, it would certainly be quicker to give repotted Dobbies sourced, of similar quality, to the contacts since homegrown takes time. I have used heated propagation for the other 11 tomato plants over the colder period, being careful to minimise moisture in the small propagator. Happily, this has done the trick since all now have their initial plant leaf growing. The aim now is to warm and cold propagate these to a good size before selecting the best few for full growth. Sweet Basil is doing fine with 8 plants to choose from for seed selection. There is one plant which is double the leaf size of the others including an older plant. This is a definite pick for flowering. The 4 younger plants may contain other such giants to improve next year’s effort. Bumble bees have exceeded 20 in number now the bush is in full bloom but soon to end feeding since 3-4 weeks is the limit. However, both hypericum bushes are just beginning to open flowers. Numbers are likely to reach 30-40 bees. I look closely at these bees noticing their tail colours which indicate type. Today, there was a red tailed one which was a first for me. I will check for numbers of these since this might indicate a new arrival. Further to my recent comment on red-backed bees, I noticed for the first time this year pairs of ‘bonking’ beetles on the bush. These were a deep red though I remember a brownish colour from previous years. This seems a likely explanation for my supposed sighting yesterday. I had presumed that the harsh winter had affected beetle numbers, as well as those of hover flies, but their appearance has just been delayed. @John Costigane: Hi John, good to hear of your progress with growing. The bees is very exciting. We are great bee lovers and deliberately plant things to attract them – comfrey being their favourite. We’ve had a swarm too which is always wonderful to watch and very reassuring when we are told they are in such decline. Bonking beetles; now there’s a thing! Comfrey seems to be a valuable herb apart from the bee sustaining role. What are your main uses for leaves, especially from the tomato and composting angles? This could be a good addition to the nectar/pollen total for home enthusiasts. There is a lull in bee activity between both main feed plants here but August should see the full yellow flower display. Week 9 has seen further progress in tomato growing. The Dobbies plant now has 7 sizeable fruit, from a gooseberry to a strawberry in size, and rough shape. Both homegrown had initial flowers removed to speed the stem forking. They now have second sets basic shape and after a tip from a relative up north the plan is to use single stems for best effect. The 8 remaining younger plants are now showing leaf buds and heated propagation will be used for both units to spur growth. Unfortunately, the 3 card potted ones were much slower growing, possibly root bound, and just like Sweet Basil the plant prefers drier conditions. Apart from the over-watering issue, over-feeding has been evident lately with 2 basil leaves affected. These had lost colour and shape and were removed. On the tomato front, alternate weekly (10-14 days) feeding is now the standard to see the effect of watering only. There has been more sunshine lately but July has been poor overall. Week 10 has seen further progress in the Dobbies sourced and homegrown pair of tomato plants. There are now 8 sizeable fruit on the 2 lowest sets. Three further sets are developing though slower than in sunnier conditions. 13 weeks seems a reasonable target for the larger plant grown from seed. This now looks like the adult plant. The last of the 3 is some way behind but still growing. Sweet Basil plants and tomato seedlings are making slow process by comparison. Hi John, we use comfrey solely for compost and ‘fertiliser’ – the leaves act as an accelerator in the compost heap – just layer them in – and you can seep leaves in water for a few weeks to make a revolting smelling, yet wonderful nutritious plant food. This can be fed to plants (tomatoes love it) like any shop bought plant food or can be sprayed on the leaves. Mr G picked 2 tomatoes this week, but they were damaged; I’m trying to find out the cause. While chatting to 3 neighbours it would seem it’s not a good year for tomatoes – the first poor year I have ever known and I’m not sure why – not too hot, surely…. Damaged tomatoes could be down to magpies as there have been a few hovering nearby here. Their young are being fed as well just now which increases food requirements. Growing garden berries would be a good way to add more food for them, as well as for the grower. This could be another target for ‘grow your own’. Week 11 has seen further growth in the leading homegrown tomato plant, which is now 20″ high just a few inches short of the twin-stemmed plant. Here, the 8 tomatoes are changing colour gradually, particularly those most facing the sun. There is plenty of red colour nearby, including dark red cloth ties for the stakes, which reflect on the fruit surfaces, possibly not the best choice of material. @John Costigane: Our tomatoes are in a greenhouse, so no bird damage there, but yes, it could be something to bear in mind for those growing outdoors. Mr G has now enjoyed 5 perfect red tomatoes and there are more on there for today! Greenhouses are the usual choice for tomato growing here as well, Mrs Green, with at least 2 of my family connections having experience there. Great to see your tomatoes ripening already. Do the homegrown ones have a better flavour? My frozen Sweet Basil leaves are still superb and they should last all year allowing this year’s plants to be left to flower. Week 12 has seen the grown from seed tomato plant opening flowers at last while the big plant has 9 tomatoes, the latest from a third set. 4 young plants are growing well and the aim is to keep them until the cold weather returns in the new year, if not sooner! The compost left from repotting tomatoes is perfect for reuse and 5 rocket/kale plants were restored from drying compost, which had slowed growth. Propagation has taken a new turn with a tray of lawn grass seed, feed and compost in the unit. I used some tomato plant compost here as well since the Lidl bagged material is very rough. If successful, both propagators will be used, probably next Spring. All that remains for tomato plants is further growth. I will post again later in the season with results, and other details. @John Costigane: John, Mr G will not eat any shop bought tomato. He says shop bought and home grown are two different things! So yes, home grown taste better – it’s all in the timing – it needs to be from plant to mouth in less than 3 minutes 😉 Great news on the basil; my plants have run to seed already; I seem to pick of flower heads daily, but they still beat me! @Mrs Green: Just when I thought September would be the earliest time for tomato reddening, Mrs Green, one fruit has recently turned pale orange all over, a second is yellow/orange and two others are turning dark green. They will be picked individually when fully red and eaten, with bacon and toast, at breakfast over the next few weeks. It will be ace to taste for myself the difference between both kinds of tomato but I am sure Mr Green is absolutely correct in his opinion of homegrown tomatoes. The homegrown tomato plant here now has collapsed flowers and 3 other young plants have four budding branches and thickening stems. These latter plants will be grown until season end and are a big improvement on my earlier root-bound efforts which came a cropper in June and July. A sign of such failure is a purple tinge on the reverse of leaves instead of the healthy green as well as the tell-tale halted growth. As for the rest, Sweet Basil is growing slowly with no sign of flowers yet. I may have to settle for leaf harvest only this year, which has seen a far poorer summer than last year. Rocket and kale are mostly eaten now since these have been less urgent than the main 2. Turf propagation has started and I hope to produce a piece of turf like those bought many years ago when the lawn was laid down. Cold propagators may be added at home to provide a decent square of grass, around 1/8th of the total lawn area, with further squares grown as required. The recent additions to MyZeroWaste should help newcomers come up-to-speed more quickly since Zero Waste is a big topic. Posting the address for used toothpaste tubes and crisp bags is most helpful and I intend sending them on when a good few have been collected. These 2 items have been bugbears since the very start of the trend, but no longer. @John Costigane: Hey John, well you have a treat in store – enjoy those tomatoes when they are fully ripened 🙂 It sounds like you’ve done brilliantly with basil, rocket and kale. My kale has been attacked by the cabbage white butterfly and suffered its fate. I haven’t been that good with the garden this year; I’ve been doing other things. Great to hear that the Philippine Community Fund is help solve some landfill issues and thanks for spreading the word! Mrs Green, following your advice, re the 3 minute warning, the 3 tomatoes eaten so far have been cut from their set and sliced just before serving with the main meal. What is most enjoyable is the ripening of the next fruit on the plant after each removal. Hopefully, the remaining 6 will follow suit. The homegrown plant is now the same height as the Dobbies’ sourced though only single-stemmed due to its late development. Pea-sized fruit, at best, are now in the first set with a second set taking shape. Recent sunshine has been a great help and let’s hope for an Indian summer. Warm propagation, essential for cold evenings (already), has helped both Sweet Basil and the 3 young tomato plants, complementing recent good weather. Sorry to read about the pest problem. My findings include damaged basil leaves, due to over-feeding, and tomato leaves ‘chewed’ at pot margin, often due to handling while carrying the largest pot. Thanks for the space to air my ‘grow your own’ experiences which has been a great help during the season. If others have had similar growing successes that will be just ace. @John Costigane: Hi John, I love that cycle too – take a few off, eat them and the next day you have something else. I have my first large tomatoes for lunch today – moneymakers, which is a variety I have not grown before. I’m cooking them into a ratatouille to have with Sunday lunch. Unfortunately some of our tomatoes are now dropping off the vines before being ripe – I’ve never had this before but I can see the parts that hold the fruit onto the vines look weakened for some reason….. We live and learn. I’ve been growing tomatoes for about 8 years and never had this! Glad you are still enjoying the rewards of your labours. Heated propagation has finally shown its value, Mrs Green, with all 3 young tomato plants filling nearly all of their side of the unit. 8 miniature branches have formed in each and first flowers may appear while still in the propagator. The idea now is to keep using it until the main stalks have grown to the roof. Sweet basil has similarly awoken from its poor summer lethargy and one plant has matched the tomatoes’ height. The homegrown plant has 5 tomatoes growing reasonably in the first set and one flower while the second set has 2 flowers. This plant may be going to a brother after a promise last year: better late than never! Dobbies sourced plant has been a fine example. Hopefully others can find similar garden centres in their locale. All but 2 fruit have been eaten with other tomatoes matching flavour if not size. The aim next year is to improve on all fronts. Compost bin beckons beyond this last pair and there is plenty of room following a part bin emptying which was severely restricted by the hypericum bush’s overgrowth. Spring may be a better choice in this respect although the compost/soil produced was far superior in texture to the early variety. Great to see your reuse of green tomatoes which are otherwise compost bound. Any leftover here will get similar reuse, saving food waste for any household missing a compost bin or local food waste collection. Best of luck for the week ahead. The National Zero Waste Week has certainly become a bigger event, all thanks to your family’s dedication. @John Costigane: Hi John, you’re doing so well this year 🙂 I love how there is always more to learn, always ways in which we can improve things and plenty of ideas for forthcoming seasons. I hope you continue to enjoy a long eating season, Mr G is convinced our tomatoes are finishing already…. Sad to see the ripe tomatoes finished there but the season has been successful. End of season is approaching here as well though there has been plenty of recent sunshine to delay the inevitable. The 3 recent tomato plants are reaching the propagator roof with 9 branches, and first sets just beginning. The idea is to keep these in the heated propagator every night for as long as possible. Two sets are forming fruit in the original homegrown and may ripen. Sweet Basil has also done well recently and there should be plenty of overwinter frozen leaves, though no seeds. The topic has been great help over the months. Thanks again for the opportunity. The current political/economic situation seems to be the only show in town making the trend less urgent. I plan to continue my own 5 year target and will rejoin for big items like Zero Waste Christmas. @John Costigane: Hi John, always good to hear your updates and it’s interesting to compare notes from one end of the country to the other 🙂 Funny about the basil; ours is pale green now with tough leaves, but lots of flower heads full of seeds. The luffa won’t come to anything I’ve decided, but I learned a lot from that. Remind me of your 5 year target John – is that one black bin bag for 5 years?? @Mrs Green: The heated propagator and frequent watering with warm water have brought the biggest plant, in particular, to life. There are big leathery textured leaves. Other more recent plants are paler and smaller, due to over-watering the seeds in the small propagator a couple of months ago. The difference between tomato and basil growing is that weekly watering suits the former while done every two days suits basil, where collapsed leaves indicate a water deficit. I had done both types weekly for a while and this setback basil growth somewhat alongside the poor July/August spell. Your luffa plant was a difficult task which may have gone better in a good summer and propagation may have helped the initial stage since heat can be maintained for the whole 24 hours during early growth. The 5 year challenge should fill 1 binbag for everyday waste (plastic) while a second may be required to hold medicine blister packs and cleared-out hard plastic items etc. It may also be possible to extend the 5 year limit. There has been a recent fall-off in junk mail to an infrequent single letter which is good news. Return To Sender seems to work. One recent plastic addition to the outside of card medicine boxes may be another target for the same. This covers patterned raised dots on the card outer and must protect the information held. Next they will be plastic coating tissues since their ingenuity???? knows no bounds. Others should look out for similar plastic forays into new areas to highlight this particular problem. @John Costigane: Hi John, great to hear about your resurrection 😀 It sounds like you’ve learned alot about perfect watering too. Some plants can tolerate you getting used to it, whereas others are dead if you get it wrong once! Thankfully the tomatoes and basil are more forgiving. Sarah over on ethics trading as a luffa baby appearing which is wonderful and has given me great hopes for next year. @Mrs Green: Reawakenings are best left for the Spring, Mrs Green, and a full season of heated propagation can make next year even better. Comparing this year’s Sweet Basil to the previous, increased plant height (12″) and leaf size (3″ long by 1″ in wide) shows the benefit of a half season use of the larger unit. The homegrown tomatoes have ripened eventually, with 3 more possible but 4 other plants are now in the compost. @John Costigane: Hi John, it’s clearly been a successful gardening year for you and it sounds like your 5 year target is going to be achievable thanks to compacting your waste. Well done you; it’s a brilliant achievement. @Mrs Green: Thanks for that though other enthusiasts, like the Green family, have comparable results since the equivalent for a family of 3 would be a 1.67 year target. Reusing plastic waste (toothpaste tubes and crisp packets) has been a great new aspect, introduce by yourself, to move the waste situation forward. It seems that we enthusiasts have to lead the changes ourselves but the positive effort of other agencies is much appreciated. The last comments for the growing effort are that the 3 green tomatoes have until Tuesday to change colour or the whole plant will be composted. The Sweet Basil has progressed to 15″ high with even broader, longer leaves. giving the prospect of pesto making next year, a vast improvement on last year’s outcome. « Zero Waste Shopping is here!